Beyoncé’s Engagement Ring from Jay-Z – A Big Bling! Beyonce’s engagement ring took Hollywood by surprise when she and Jay-Z wed in secret in April of 2008. Like many celebrity engagement rings, it features an enormous center diamond worthy of Beyonce’s star status; an eighteen-carat flawless diamond valued at over five million dollars by jeweler Lorraine Schwartz. It’s among the world’s most expensive engagement rings, and it’s also one of the most famous. The superstar couple love to enjoy the spotlight when it comes to their careers, but they prefer to remain mum about private matters, never responding directly to gossip, and often portraying themselves as a loving family despite rumors that they’re an outlaw couple. Through talk of breakups, fast-paced tours, and family vacations during which paparazzi chase them unceasingly, Beyonce and Jay-Z keep their cool. Will we ever learn the details of their engagement and secret marriage? No one is certain. Like Beyonce’s engagement ring, this stunning example from Brilliance features a gorgeous center stone; hers appears to be an emerald cut, while this one features a cushion cut. Since your budget may not be able to handle a giant diamond like Beyonce’s, consider a halo setting, which will increase the sparkle of your engagement ring while helping you stick with your financial goals. 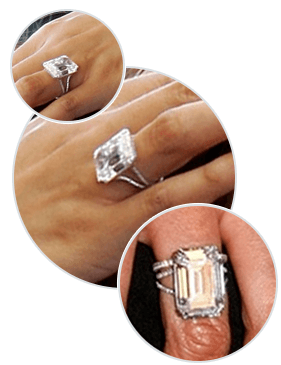 The split shank on this example is narrower than the one supporting Beyonce’s diamond, but it is in proportion to the overall ring. Born September 4,1981, in Houston, Texas, Beyonce rose to fame during the late 1990s, when she starred as lead singer of the group Destiny’s Child. Her debut album, Dangerously in Love, established her firmly as a solo artist, selling 11 million copies worldwide, earning five Grammy Awards, and gaining acclaim on Billboard’s Hot 100 list. Beyonce has been unstoppable since the beginning, displaying charismatic energy that is simply irresistible. Characterizing herself as a modern-day feminist, Beyonce produces songs that feature themes of female sexuality and empowerment alongside those of love and monogamous relationships. She is one of the best-selling music artists of all time, and was Billboard’s Top Female Artist of the 2000s as well as their 2011 Artist of the Millennium. Forbes ranks her as the highest-paid black musician in history, and Time listed her among the world’s most influential 100 people in both 2013 and 2014. Did you know that Beyonce has a long-standing relationship with Pepsi? She’s been working with the soft drink company since 2002, releasing some of the most entertaining commercials ever to grace TV and the internet. What Our Experts Have to Say about Beyoncé’s Engagement Ring. Beyonce’s engagement ring is classic Lorraine Schwartz – bold, beautiful, and incredibly dramatic. The style suits Beyonce perfectly, capturing the essence of her personality while boldly proclaiming the love Jay-Z and Beyonce share. Lorraine Schwartz uses only the best stones in her designs, primarily producing jewelry for A-listers. The diamond in this Hollywood engagement ring is about 18 carats and is well worth the $5 million Jay-Z reportedly paid for it. Despite the high prices that accompany most celebrity engagement rings, it is entirely possible for you to get a Hollywood-inspired look of your own without breaking the bank. By working with Brilliance, you can easily design a ring that suits your style as well as your budget. Our online design tools are easy to use and we work with you to ensure you get perfect results that you’ll enjoy for life. Whether you choose a replica of Beyonce’s engagement ring or something just a little different, you’ll be thrilled with the sparkle it delivers.